Once you finally get into the exercise groove, it can be tempting to keep adding more hours and days. The logic is simple, but flawed: If I’m getting results with my current level of exercise, I can speed up my progress and get even better results by doing more. That’s when you see people working out twice a day or working out every single day of the week. Sorry folks, but that’s not going to work. The unfortunate fact is that if you overtrain, you are actually going to slow your progress. You may even lose ground, if you push too hard and get injured. Your body simply needs time to recover, heal tissues, and repair and strengthen muscle. There are a lot of things that you need to do to recover after hard exercise; do some cool down activities, stretch, drink lots of water to rehydrate, eat some carbs and protein to improve recovery, etc. Another great recovery method is to get a massage, which helps increase blood flow and circulation in those stressed muscles. But, as nice as it would be to get a massage every day, we don’t always have access to a great sports massage therapist. That’s where the foam roller comes in. 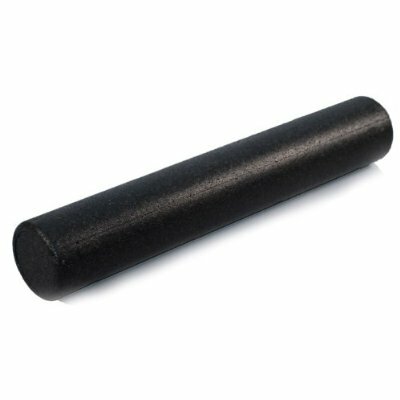 A foam roller is basically a thick cylinder of hard-celled foam that comes in different lengths. My new one is 3 feet long and works really well. You can see the model I bought on my Gear page. It provides something called “myofascial release”, which is a technique that results in softening and lengthening of the fascia over your muscles. By focusing the roller on places where you are stiff, sore, or are experiencing reduced flexibility; you can break down unwanted adhesions between the fascia and the underlying muscle tissue. It increases blood flow and circulation to the muscles and tissues to promote healing. NOTE: Keep in mind that using a foam roller isn’t for everyone. If you suffer from heart disease, have vascular issues, or chronic pain; talk with your doctor first. Ok, for the rest of you, let me be honest. When you use a foam roller correctly, it kind of hurts. For some spots, like rolling out your IT band on the side of your thigh, it REALLY hurts. But, I’ve noticed that it gets better the more you roll and the discomfort means that you are really working the muscles and tissues well. Grit your teeth and hang in there! It will be worth it. I have to admit that I was skeptical the first time I heard about using a foam roller. But, I was pretty sore the first couple of weeks when I started doing CrossFit, so I decided to give it a try. The technique for rolling is pretty simple. You basically place the part of your body that you want to massage on top of the foam roller. Your body weight creates the downward pressure onto the roller, as you gently roll back and forth across it. You can control the pressure by applying more or less weight on the roller, essentially lifting yourself with your hands and feet to either hold yourself up off the roller or letting your body rest on the roller for increased pressure. I know this probably sounds complicated, but it really isn’t. There are a lot of videos on YouTube that show a variety of foam rolling techniques. So, explore and be creative with how you position the roller and yourself to attack different spots. The foam roller is not only great for recovery after a workout. I have now started to use the roller every morning before my workout as well. Foam rolling before your workout is a great technique to add to your regular stretching for a better warmup. It does a great job of getting the blood flowing in the muscles and warming up those tissues so that you stretch easier and perform better. So, I roll for about 10 minutes before exercise and about 10-15 minutes after I exercise as part of the cool down. I’m a convert. Believe me, it works! So, give it a try and add it to your daily routine. I think you’ll be pleasantly surprised by how much better you feel.